Again with the whole not seeming like a real New Yorker (or at the very least a real midtown office worker), this was my very first Seamless Web experience. Ordering was really easy, I picked my lunch special, was able to choose between soup or salad and specify whether I wanted my dish mild, medium or spicy. I liked how you could include special comments for each order. And since I rarely have cash it was nice to be able to pay securely online. I placed my order at 11:33pm and by 12:04pm my lunch was waiting downstairs. Sadly ordering was probably the best thing about lunch. When the order arrived LC and I immediately knew something was off. The noodles were on the pale side and clumpy. Not to mention they didn't look like the extra broad Pad See Eew noodles that I'm used to. One bite confirmed that they were dry and fairly flavorless. LC pulled out some soy sauce to doctor the noodles, but that didn't do much. Fail. Major fail. Now I've had bad Pad Thais in the past, but never such a lackluster Pad See Eew. I love Thai noodle dishes. Unlike Thai curries they aren't something that I can easily make at home. When Lawman and I go out we typically order at least one noodle dish so consequently I tend to judge a place by their noodles. I had high hopes for Breeze Thai. A good friend who is very particular about Thai food highly recommended it to me. She didn't have the Pad See Eew, but she said every dish that she tried has been consistently excellent. Maybe this Pad See Eew was the exception, maybe the chef was having an off day, but in all honesty LC and I couldn't finish our lunch. And what's more, we didn't want to finish it. Next time I want Pad See Eew I'm sticking with Song, Wondee Siam, or Pongsri Thai. Where do you go for awesome Pad See Eew (or Pad Thai for that matter)? Better to eat there, enjoy the decor, and try one of the thai-inspired sandwiches or traditional curries. Worth another try. I'm exactly the opposite of you when it comes to delivery. (Meaning that I can count the number of times I've cooked in my apartment in the last four years on both hands.) 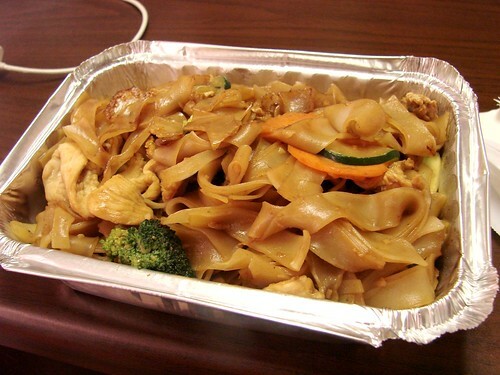 One of my favourite restaurants to call is the Midtown Lemongrass Grill both for their Pad Thai, which I use as the standard by which I measure all other Pad Thais, and for the fact that they basically deliver your food before you hang up the phone with them. Of course, I'm from Ohio and had never tasted Pad Thai until I moved here, so I'd be interested in what you think of it. @donuts4dinner: I like Pad Thai when it's done well. My favorite Pad Thai that I've encountered is from Song in Brooklyn (or it's sister restaurant, Joya). It's much better if you go in person because it literally goes from wok to plate in a matter of moments. The sauce is rich and delicious. It's not too sweet with a great peanut flavor. I've never been to Thailand so I don't know how it compares, but of all the Pad Thais I've tried, theirs is definitely tops in my experience. I haven't been to any of the Lemongrass locations since college. My husband's family used to have a Thai cook and he's been to Thailand, so he's pretty particular. He's not a Lemongrass fan and in our experience it was always pretty mediocre. That said, it's been a long time, so maybe the food has improved in the interim. 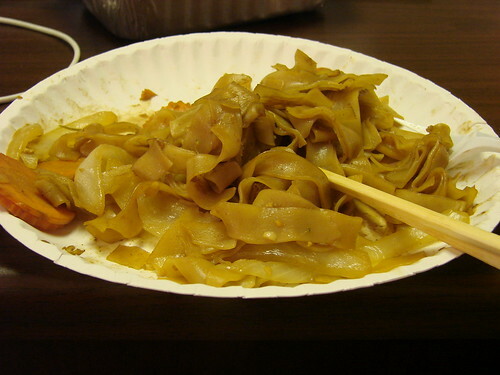 My roommate is in love with Joya and I agree they do a good job with their Pad Thai and Pad See Ew. Sometimes I go to Thai Sesame on Smith St and they have a pretty good Pad Thai. But so far my favorite is Beet in Park Slope. I also taught myself how to make Pad Thai didn't really taste like Pad Thai but it was good. If you ver make it to queens - you have to try BKNY Thai. They have the best food - they make an awesome Pad - Thai and their Khee Mao noodles are to die for! !